HNRC implemented the NV200, NV400, and NV900 units in selected areas. This study compares the total number of repeat infections, nosocomial C. difficile infections, and nosocomial respiratory infections before and after implementation of the Novaerus technology. 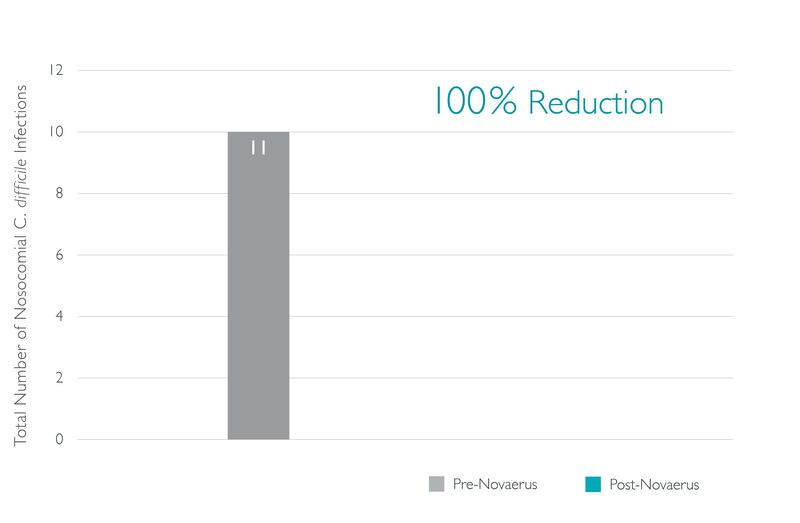 The periods selected pre- and post-Novaerus review were January through April of 2012 and 2014. Comparison of like periods in both years reduces the risk of skewed data related to seasonal variances. In the period after implementation of the NV200, NV400 and NV900 units in selected areas, the total number of repeat infections at HNRC decreased from 16 to 10, a 37.50% reduction. The total number of nosocomial C. difficile infections decreased from 11 to 0, a 100% reduction. The total number of nosocomial respiratory infections decreased from 42 to 28, a 33.33% reduction.